Which browsers does Sublime LMS support? Because it's built using web standards, Sublime LMS runs on Windows, Mac, Linux, iOS, Android, or any other device with a modern web browser. Sublime LMS supports the last two versions of every browser release. We highly recommend updating to the newest version of whatever browser you are using as well as the most up-to-date Flash plug-in. Some supported browsers may still produce a banner stating Your browser does not meet the minimum requirements for Sublime LMS. If you have upgraded your browser but you are still seeing the warning banner, try logging out of Sublime LMS and deleting your browser cookies. If you are using an unsupported browser, you can update your browser, or you can dismiss the warning banner during the duration of your browser session. For instance, testing centers can dismiss the banner and it won't appear until the next browser session. Flash is required in several places in Sublime LMS: media recording/streaming and viewing as well as uploading files to a course or an assignment. Other than these features, Flash is not required to use most areas of Sublime LMS. The Java plug-in is required for screen sharing in Conferences. Please note that some browsers do not support Java. Otherwise, there are no other browser plug-ins used by Sublime LMS. There are a couple of different ways to update your desktop browser. 1. Every time you open your browser, it will check to make sure it is using the most current version. If it is not updated, your browser will prompt you with a notification and walk you through the update process. 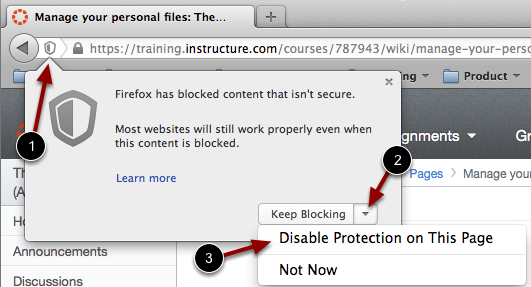 Some browsers may occasionally make modifications to privacy settings to protect users from possible unsecured content. Unsecured content is identified with the prefix http:// in the URL and can create mixed content in your Sublime LMS Page. Secured content is identified with the https:// prefix in the URL. Note: If you embed Sublime LMS lessons inside your course, you can now prevent browser issues with mixed content using secured Sublime LMS Guides URLs. We recommend following any browser security policies established by your institution, especially if you are using Sublime LMS on a computer provided by your institution. You may want to use Sublime LMS in an alternative browser instead. If you are using a browser that is affected, please be aware of possible restrictions. The following are known issues in specific browsers that may block or create mixed content within Sublime LMS. Google Chrome verifies that the website content you view is transmitted securely. If you visit a page in your Sublime LMS course that is linked to insecure content, Chrome will display a shield icon in the browser address bar. You can choose to override the security restriction and display the content anyway by clicking the shield icon and then clicking the Load unsafe script button. Allow access to Sublime LMS via the Adobe Flash Player Settings . This prompt appears in the center of the video and audio pop-up windows, or the center of the browser if you are accessing Conversations. Allow access to Sublime LMS via Chrome's media permission settings . This prompt appears just below the address bar. Click the Allow button. Firefox verifies that the website content you view is transmitted securely. If you visit a page in your Sublime LMS course that is linked to insecure content, Firefox will display a shield icon in the browser address bar . You can choose to override the security restriction and display the content anyway by clicking the shield icon, clicking the Keep Blocking drop-down menu , and selecting the Disable Protection on This Page option . Since Sublime LMS uses small elements of Flash, not all Sublime LMS features may be supported on mobile devices, especially on iOS.